Last night at the Lo-Pro Mixer, someone asked me what I consider to be Very Vintage Vegas. At first I thought he was asking about the types of neighborhoods, and types of homes. But it turns out he was asking if there were geographic boundaries. This is the map that I have set up in the MLS for myself with the “boundaries” of the neighborhoods, era, style and types of house that are of most interest to me. 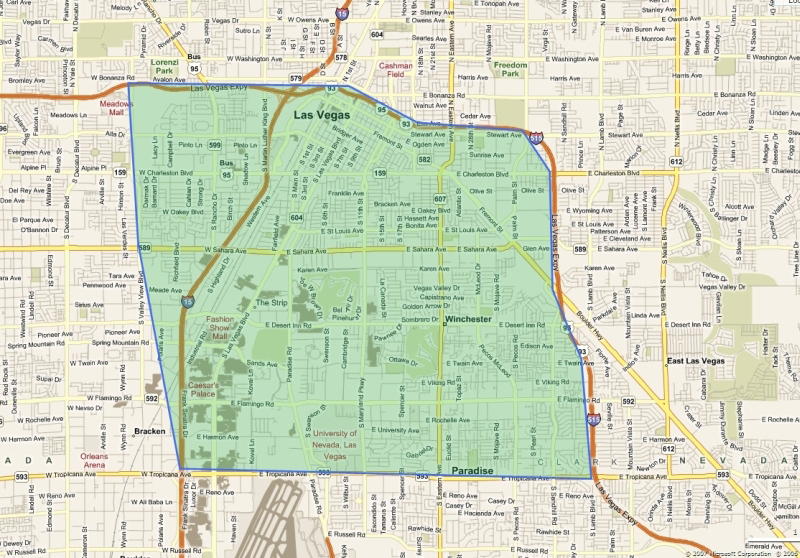 Of course with 18 years selling real estate under my belt, I’m familiar and knowledgeable about almost all areas of Las Vegas, including the Suburbs but what’s in the shaded area is what I’m most passionate about, and it seems to match up pretty well to the interests of most of my readers and clients as well. 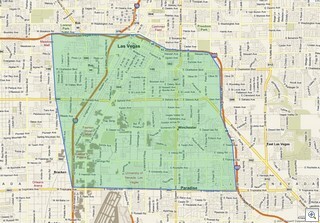 Of course most of our focus is on the downtown neighborhoods, and Paradise Palms on the east side, and all of the fabulous neighborhoods such as McNeil, Scotch 80’s, Westleigh, and the various “Ranchos” (Rancho Bel Air, Rancho Nevada, Rancho Manor etc) on the west side. There’s other neighborhoods with mid-century modern or otherwise unique homes such Charleston Heights, which is west of Decatur between Oakey and Alta, and Winterwood which is off of Sahara East of Nellis Ave. There’s also some great modernism along Washington and Vegas Drives west of Rancho, and in “vintage” North Las Vegas, but I rarely get asked about those areas. I extend my map down as far as Tropicana, because there’s so much interest in the various townhome communities such as Sunrise Villas, Braewood and Heritage Square, Forest Hills, Garden Park, Tiburon and many others. Also, I have to go as far south as Tropicana to include two of my favorite neighborhoods which were out in the desert and very rural when they were built. They are Royal Crest Rancheros, and Paradise Crest. In the meanwhile, Think about who you know who ought to be thinking about buying during a buyer’s market, now that we seem to be hitting the bottom of the downturn. Let me know who they are. They deserve an agent who understands “old” homes, historic neighborhoods, and the market in general. Tell them about this blog, and about me. I’d appreciate it, and so will they.